Cold feet? Ski boot heaters & thermal insole boot & shoe warmers under $20. Styles fit all boots & shoes. Battery FREE & Chemical FREE, HeatShields reflect natural heat reducing heat loss in cold environments. WarmFeet and HeatShields fit all boots and shoes keeping feet warm. For most shoes and boots select WarmFeet Undersoles or Overtoes. Inserted under existing insoles keeping feet warm. For ski boots & boots with removable liners select Original HeatShields and HeatShields ProSkier or Traveler. For ski boot heaters and heated footbeds or custom orthodics select Warmfeet Underbeds. Sticks to existing footbeds. * Battery FREE! and Chemical FREE! * Get Warm Feet With WarmFeet and HeatShields! * Multi thermal layers reflect heat and keep feet warm! * Made in the U.S.A. with quality and satisfaction assured! The worlds first - heat reflecting-multi-thermal layer - insist on the original! Cold feet? Ski boot heaters & thermal insole boot & shoe warmers from under $20. Styles fit all boots & shoes. Battery FREE & Chemical FREE, HeatShields reflect natural heat reducing heat loss in cold environments. HeatShields come in different styles to fit all boots and shoes. Original HeatShields and v.3 ProSkier styles peel and stick to the outside of the inner liner of most ski boots, snowmobile boots, and many snowboard and hunting boots. For skiers who travel the v.3 ProSkier Traveler is removable. The v.3 undersoles are removable and slide underneath existing insoles, footbeds, orthodics, electric footbed heaters, and are designed to fit any shoes or boots. New v.3 Underbeds are a peel and stick footbed reflector designed for use with electric boot heaters, Underbeds can be stuck to the bottom of most insoles, footbeds, orthodics, bootbeds, and really upgrade your current electric ski boot heaters! Bitter winter weather can frostbite your toes, before you take off for your favorite mountain or ski resorts this winter make sure you have your HeatShields. HeatShields - The worlds first heat reflecting-multi-thermal layer for winter sports footwear, shoes and boots. Battery FREE & Chemical FREE - Multi thermal layers reflect heat and keep feet warmer in all shoes and boots. Keep your feet warm this ski season using proven HeatShields Multi-thermal technology. Peel and stick to ski boot liners or any removable boot liner! Fits Ski boots and boots with removable liners. v.3 proskier is designed for the onsnow pro skier and features enhanced thermal reflection with additional layers and coverage and performance. Peel and stick to the outside of removable liners of ski and some snowboard boots. v.3 proskier traveler is designed for the onsnow pro skier who uses different ski boots, demos or rentals and features enhanced thermal reflection with additional coverage and performance. Removable and easily transfered to other boots. Fits Ski boots and boots with removable liners. Peel and stick to the underside of footbeds, insoles, electric ski boot heaters or heated footbeds. Can be adhered to the bootbed. Has hole for passing the wires of some boot heaters if required. Great for electric ski boot heater upgrade. For Hotronic(tm) and other heated footbeds, orthodics and bootbeds. v.3 pro undersole-overtoes fit all boots and shoes. Covers toes for added warnth in all boots and shoes. Trim to fit underneath shoe and boot insoles with over the toe coverage. Fits all shoes and boots. PalPal and major cards accepted. Shipping is USPS Priority. International orders welcome. Shipping is prompt. HeatShields fit all types of boots and shoes with or without liners. Removable non-adhesive styles allow for switching from one pair of boots to another. 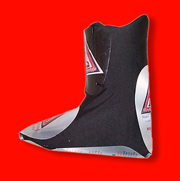 HeatShields are the World's First Heat Reflecting Thermal Layer for boots with removable liners. Constructed from multiple layers of special heat reflecting materials, HeatShields are the original battery free and chemical free way to warmer feet. HeatShields wrap around and stick to the outside of the inner liner of ski, snowboard, snowmobile and winter sport boots. Underbeds and undersoles slip into boots and shoes underneath the insole or footbed. HeatShields reflect heat naturally produced by your feet and help to keep heat from leaving the boot. They are used by instructors at many ski schools including Killington, Aspen, Park City, Alta and all over the Poconos. HeatShields are also used by members of the National Ski Patrol and the University of Nevada Ski Team. Will my boots still fit? Yes, HeatShields are very thin, so your boots will still fit great. One size fits all boots. With proper care HeatShields can last for seasons of warmer feet. Original HeatShields are a multi-thermal layer of proven heat reflecting materials. The shaped design eliminates cutting or trimming...one size fits all boots. Take the first step toward warmer feet...In minutes, put HeatShields in your boots. Original HeatShields work well in all boots that have a removable liner. This includes most Ski Boots and many Snowboard, Snowmobile, Ice Climbing, All Weather, Hunting and Cold Weather Boots. HeatShields v.3 undersoles and underbeds can be used in shoes and boots with or without removable liners. HeatShields are very thin so your boots will still fit great. to provide greater comfort during power failures. Upgrade your electric boot heaters with HeatShields! A pair of Original HeatShields can be yours for just $19.95 US plus Shipping and Handling. Professional skiers and athletes rely on HeatShields to keep their feet warm. Onsnow pros know the importance of keeping warm and maintaining muscle coordination and response time. and are proud to see people strive and achieve their personal best. The Keystone State Games and the Ski Windham Disabled Sports Program. Please join us in supporting achievement and adventure for all! We also help support many ski clubs and racing programs. You can find HeatShields in the Coolest Ski and Snowboard Shops in the USA or order online. Of course we make WarmFeet and HeatShields in the United States of America for quality you can trust to keep your feet warm!